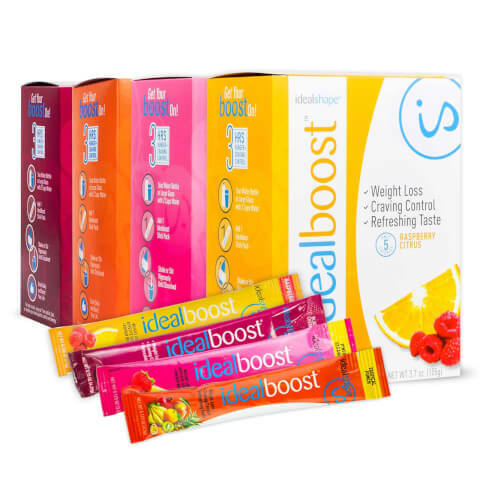 IdealBoost drink packets offer a refreshing blend of weight loss and fat burning ingredients! IdealBoost weight loss drink mix is low-calorie, sugar-free, that provides energy with a blend of green tea and caffeine. In addition to the metabolism-boosting benefits of caffeine and green tea, IdealBoost contains IdealShape’s signature hunger-blocker, Slendesta, to give you up to three hours of appetite control. IdealBoost also contains vitamins B3, B6 and B12, which contribute to healthy cell function, improving everything from our skin, to our metabolism, to our mood. Vitamin B deficiencies can result in depression, high blood pressure, and cognitive impairment amongst other problems, making it an imperative component of your diet.